It is the release day! Hey everyone, Hope you have been enjoying all the new halloween and non halloween projects I have sharing during the sneak peeks of Taylored Expressions release. Well today is the day all the new products are released! Yay! All of them are available for purchase at Taylored Expression Store. 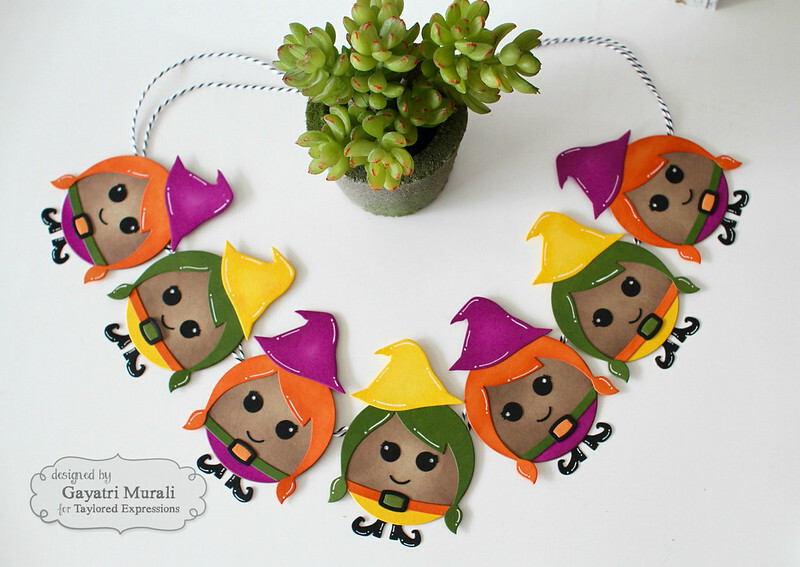 Being the release day, I am showcasing a new die called Roly Poly Witch die. This is a builder die, where you die cut the elements and put together the witch. I love this die because honestly this witch is so cute that I made a card and a banner. This die is also versatile, that you can die cut the elements using different colours, not add the hat and make cute girls banner! Perfect for a little girls party. You will see what I mean. Here is the card first. 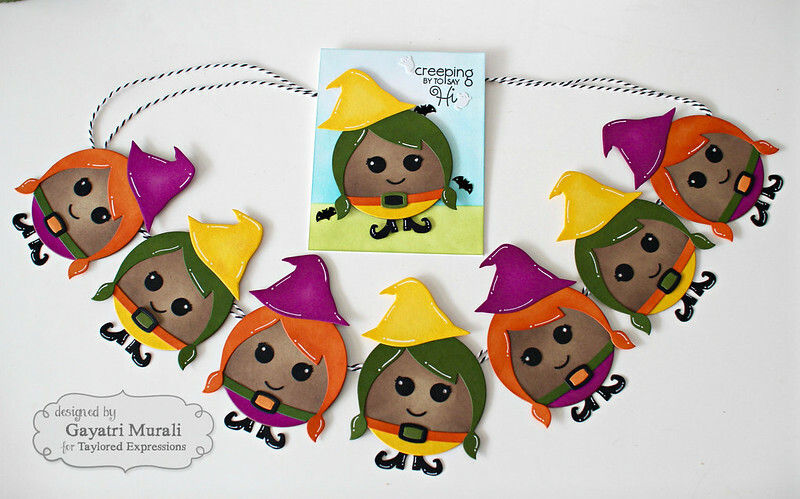 I have used Peapod cardstock for her hair and buckle, Pumpkin cardstock for her belt, Lemon Meringue for her belly and hat, Oreo cardstock for her eyes, boots, mouth and centre of the buckle. Her body is die cut using Toffee cardstock and circle die and sponged with Chocolate Truffles hybrid ink. I also sponged the respective ink on the die cut elements to add depth of them I assembled and glued the die cuts in place. Then added highlights using white gel pen. For the background of the card, I masked and sponged the bottom with Granny Smith TE ink and top part with Salt Water Taffy TE ink. The sentiment is from Boo to You stamp set stamped with Oreo hybrid ink. I have embellished with the ghost and bat sequins from Build a Scene Halloween. This was so much fun to make. I am sure kids will love it as halloween decoration on the mantle or something. Oh I wish I celebrated Halloween 🙂 My daughter then said, mum if you use non halloween colours and don’t use the hat, it will be a great gift for a little girl to hang it in her room! I agree. I am going to make one such banner for my niece. I am sure she will love it. Okay here is the card and banner together. Hope you like my project for today. All the supplies I used for my project are listed below. Check out Taylored Expressions Blog for more projects from designers. And all the new release stamp set, dies and embossing folders are now available for purchase from Taylored Expressions Store. OMG!! Your card and banner are AWESOME!! 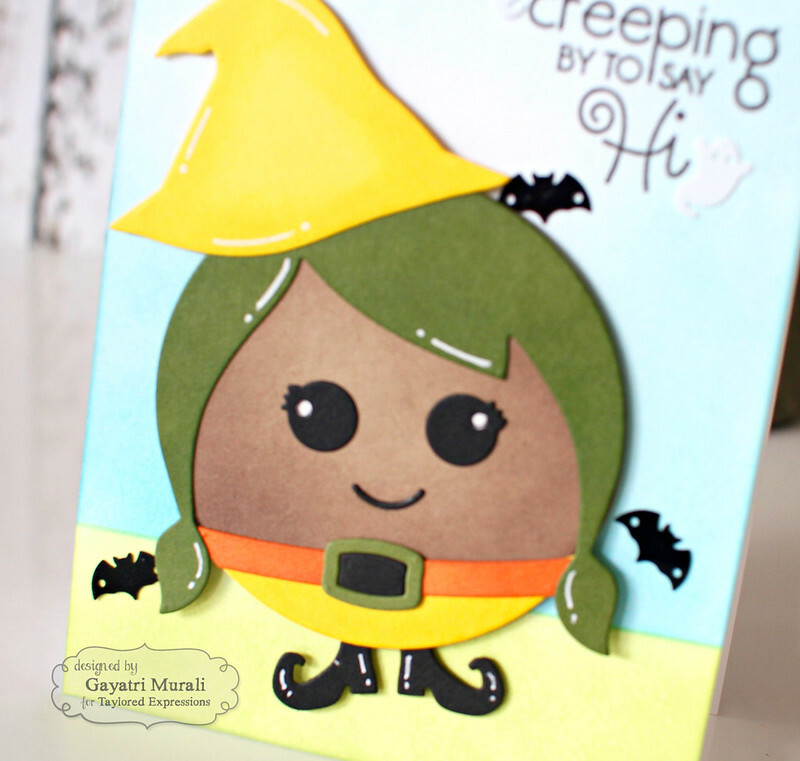 I am DEFINITELY sold on the Roly Poly Witch and the new stamp set!! Thank you for the inspiration! !